I was tagged by KmKat…..
1. What time did you get up this morning? Which time? 2. How do you like your steak? Dead. Very dead. 3. What was the last film you saw at the cinema? Van Helsing. Yes, I think it's funny, too. 4. What is/are your favorite TV show(s)? Dr. Who, Torchwood, Mystery! Shall I stop there before everyone realizes what a total weirdo I am? 5. If you could live anywhere in the world where would it be? Spain. 6. What did you have for breakfast? Glass of water. 7. What is your favorite cuisine? Mexican. Hello! 9. Favorite Place to Eat? At a table. 11.What kind of vehicle do you drive? Motor car. 12. What are your favorite clothes? Comfy, loungy type stuffs. 13. Where would you visit if you had the chance? Spain. 14. Cup 1/2 empty or 1/2 full? I can't see it from here. 15. Where would you want to retire? Three guesses. 16. Favorite time of day? Early morning when it's just getting light and everything is quiet. 17. Where were you born? In a hospital. 18. What is your favorite sport to watch? Men. 22. Bird watcher? I prefer boys, but birds work in a pinch. 23. Are you a morning person or a night person? I can go either way. 24. Pets? No. He escaped. 26. What did you want to be when you were little? Safe. 27. What is your first childhood memory? Sitting in my aunt's kitchen with all my cousins, feeling safe and loved. 28. Are you a cat or dog person? I can go either way. 29. Are you married? Not currently. 30. Always wear your seat belt? Always. 31. Been in a car accident? Yes. 32. Any pet peeves? Oh, honey, my pet peeves have pet peeves. 33. Favorite pizza topping? Pepperoni, black olives and mushrooms. 35. Favorite ice cream? Chocolate cherry. 36. Favorite fast food restaurant? Taco Bell, I guess. 37. How many times did you fail your driver’s test? Did not fail. Passed the first try. 38. From whom did you get your last email? Claudia. 39. Which store would you choose to max out your credit card? Maxing out would be very bad. We don't think about things like that. 40. Do anything spontaneous lately? Yup. Got a huge coke on the way home the other day. 41. Like your job? Does anyone? 42. Broccoli? Only if it's fresh. 43. What was your favorite vacation? When I have it, I'll let you know. 45. What are you listening to right now? Computer fan, sprinkler. 46. What is your favorite color? Shockingly, I do not have one. 47. How many tattoos do you have? None at this point. 48.How many are you tagging for this quiz? None. I don't like assigning this kind of homework. 50. Coffee Drinker? Good Gods no. Today we will see the arrival of comment # 15k. How cool is that?! It's a Spinner's Grab Bag that I purchased from Knit It Up over at etsy. There are three half ounce bumps of different fibers there and the extra added goodie that I was totally not expecting of tencel plying thread. All in a super cute little bag that I already have plans for. From left to right, the fibers are merino cashmere blend (80/20) in Day Hike, merino bamboo blend (50/50) in Naked, and merino tencel blend (50/50) in Ophelia. The plying thread is in bronzie and is so much nicer in person. As a semi-new spindler, I haven't worked with a lot of different fibers yet and loved the idea of this little kit. I don't want to deal with four ounces of a fiber when I just to figure out what it's like. Ya know? Sort of like kissing a bunch of different people to see what works for you. Couldn't argue with the price, either. When ordering, I left the seller a message. I mentioned the drop spindling, my desire to try new fibers and asked if it was at all possible I would love to try the bamboo blend, but understood if it wasn't. As it was pointed out in comments yesterday, you don't know if you don't ask. On my purchase invoice, the seller had handwritten "bamboo blend" next to what I was getting. I love that she made a point of sending me what I had asked for. She did not have to. I would have been happy with whatever she sent me, but I love her a little for giving me the bamboo blend. Now I'm so in love with that purple colorway that I have to place another order with her as soon as I feel like I've got two nickles to rub together. Hate this economy. Oh, and if you go visit Knit It Up over at etsy and order something, tell her I sent you. Let me know if you do and I'll even tell you my fake etsy username and everything. And today's shopping show and tell is brought to you by the one year anniversary of me having my beloved cat to sleep. I can't believe it's been a year without her... and I really can't believe it's been a year of sleeping in a bed with no kitty litter bits in it. There really is an upside to everything. *Title edited because I'm a dumbass. Last week, Bams posted this yarn on her blog and mentioned not knowing what to do with it. It's a merino bamboo blend and there's over a thousand yards of lace weight there. Again, it's handspun lace weight. This time it's over 600 yards of alpaca love that she dyed herself. Have I ever mentioned that our Bams is good? Because, honey, this girl is good. I'm starting to entertain fantasies of knitting with nothing but handspun. Considering how slowly I knit these days (and how amazing my friends are), it might just be possible. And I thought I was a princess for only wearing handknit socks. I see a whole new level of princess coming my way. 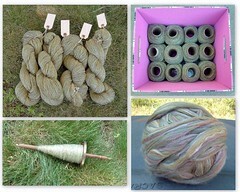 This is (most of) what I spun during the Tour de Fleece challenge on Ravelry. I started with a pound of wool silk roving (and some reservations) and ended up with 2574 yards of semi-lace weight for my darling Joan... who sent the roving and later on a stunning a spindle. Better photos can be seen at Joan's. Now the ball... err skeins are in Joan's court and I can relax for a bit. Or just keep spindling which is what I've been doing. Many thanks to the spinners of Team CrankyPants! for being so encouraging, funny and wonderful. Sometimes it's a state of mind. Norma posted photos of her Faux Russian Stole today. She really does look fabulous with it. Don't you think? Yarn: Mysterious Russian wool. 1613 meters per 100 grams. Held triple. Knit for The Norma, who sent the yarn and gave me the book with the pattern. Mods: None. A couple of booboos on the edging, but nothing I meant to do. Knit with my Joan, who held my hand while I tried to figure out how to pick up the right number of stitches from the bottom edging. Again? : Maybe. I wouldn't mind doing it again. Just not right now. If you don't know the story of this stole, go read Norma's post. This is one of those projects that has become a bit hazy with the passage of time. I vaguely remember being slightly cranky over it, but can't recall exactly why. Not that I'm complaining. That haze is a big reason that I keep knitting. I'm not entirely sure I still knit, but that's something we can talk about on another day.